The gameplay is very repetitive as there just isn't much variety to the game's one stage, "that's right one stage" if you want to play additional stages you must purchase the paid dlc packs. The lack of content really hurts the replay value of the game. 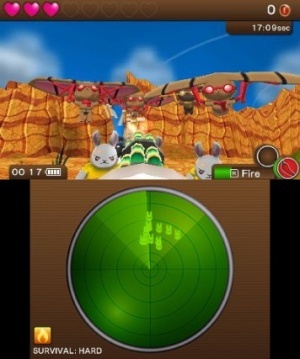 The controls are also incredibly wonky and very sensitive which makes playing the game a serious chore. The audio-visual presentation on the other hand is really nice with adorable enemies and a colorful and cheery stage design the game truly looks great, while the sound effects and music are also quite fun and cheery! 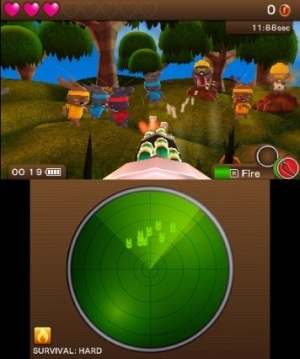 With repetitive gameplay that can be fairly enjoyable for short periods of time and an excellent audio-visual presentation, Blast 'Em Bunnies had the potential to be a solid 3DS eShop title, however poor controls and an utter lack of content really hold this game back and negatively effect our opinion of Blast 'Em Bunnies. It can be fairly fun for short bursts so we give the game a poor recommendation rather than a bad level of recommendation. 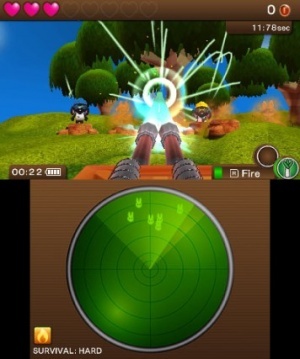 Nnooo used to make such good games.